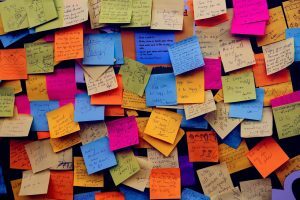 Successful people keep notes. They write down their ideas, so they don’t forget them. They don’t act on every idea but on occasion they go back through their notes and see what inspires them. A new project can be born from an idea they had years ago. The same principle can be used as a tool to help you develop your intuition and achieve more spiritual awareness. Whether you are consciously aware of it or not we are all connected to a higher source of wisdom. Taking a moment to write down what you receive in a flash of insight can help you on your journey of consciousness and spiritual growth. I am often asked how I developed my intuition. My answer? I did it through journaling. The simple act of writing out my thoughts and feelings helped me to tease out what was wisdom and what was just my ego. When I saw it written down on paper it didn’t take long to see what a huge difference there was between the two. I also learned how my expectations could hamper receiving intuitive insights. For example, if I asked a question while in meditation and didn’t receive an answer right away my immediate response would be to feel discouraged and frustrated. Yet, my day would be filled with interesting encounters. I would hear a song on the radio and a line from the song would answer the question. Or I would see a picture that made a deep emotional impression. The answer would come to me from a word or phrase picked up in a conversation. Or a book on a shelf picked up at random that would fall open at a passage that told me what I needed to know. Taking notes showed me that I was always getting the answer I had being looking for I just needed to be more open to how I was receiving the answers. Life isn’t always what we expect but we can always expect an answer. Taking note may help you to see that more clearly and become more adept at understanding and learning from your intuition. The universe works in mysterious way. We need to be more open to the mystery and take note. Atherton Drenth is the author of Intuitive Dance. Building, Protecting & Clearing Your Energy, (Llewellyn Worldwide) and Following Body Wisdom. Atherton also appears in the documentary, Voyage to Betterment as one of 12 experts along with other internationally renowned physicians, researchers, and pioneers in the fields of consciousness research and spirituality.